As a self admitted foodie, I am a sucker for a good farmer’s market. In the past few years, the suburbs of Chicago have been adding farmer’s markets throughout. With great produce venders and many purveyors of all things tasty and homemade, you can find only the freshest ingredients. Needless to say, you will know where to find me on weekend mornings during June through October. 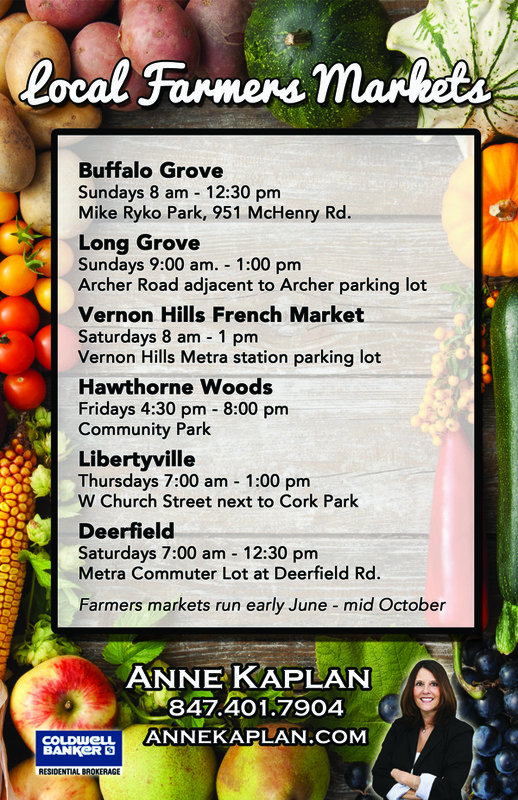 Libertyville, Deerfield, Long Grove, Hawthorne Woods, Vernon Hills and Buffalo Grove all have wonderful farmers markets worth checking out. Check out the schedule and I hope to see you there! Mike Ryko Park, 951 McHenry Rd. Metra Commuter Lot at Deerfield Rd.